The IC-718 comes with the HM-36 hand mic and OPC-025A DC power cable. A solid, basic rig, with features that get you on the air. As the first review posted on the IC-718, let me say that a review based on a comparison with more expensive radios is a poor review. One must evaluate the radio on it's OWN merits for what it is designed for and not what it doesn't have or doesn't do compared to higher end rigs. Obviously, more expensive radios with far more features can DO more and you get what you pay for. But, that is not a fair review. I have owned two IC-718's over the years and enjoyed both of them. 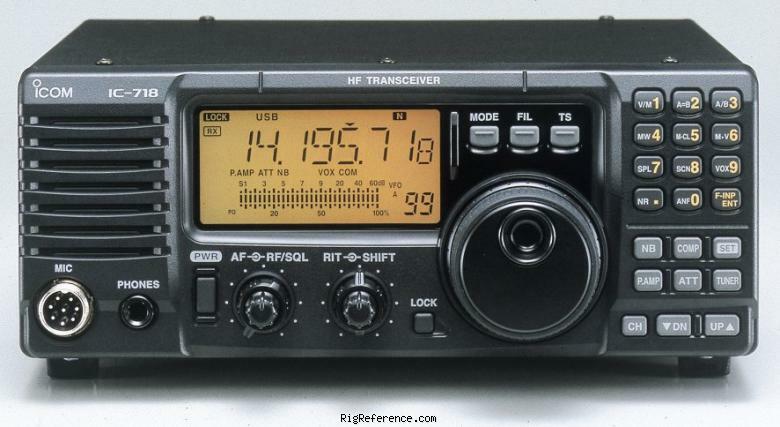 The first one was bought new from HRO and was given a workout over three years operating CW, SSB and PSK31. This is my first recommendation to a new ham breaking into HF or for someone on a limited budget looking for a solid rig to use. In particular, I was impressed with the receiver sensitivity which was comparable to many of the far more expensive radios and I found it very stable which suited it well for digital operating. The radio is laid out very well and is easily operated by new and experienced operators. It is especially well used for portable and emergency work as it is compact and rugged. This would be my choice as recommended for a new ham getting into HF operating. It does everything it is designed to do and will satisfy most needs. If I were to mention any negatives, it would be the volume control that gives off a 'pop' when turned up from the fully counterclockwise position as a minor design deficiency. What I did find really enhanced operating was to find a good volume setting and vary the RF gain downward which reduced the background noise considerably with very little reduction in signal level. A little practice doing that really make this a nice radio to use. I first purchased this rig in 2000 for my Father, he used it day after day working the world on a dipole. Good reception especially with the DSP board added.After his passing i used the 718 as my main transceiver this time hooked up to a OCF dipole working the world on SSB. 100 watts is plenty, team it up with a desk mike like a SM6 and a good power supply capable of 20amps continuous and you are in business. The best part is that it is simple you can get on pick up DX and go to the next signal while others are mucking around with adjusting knobs. This is a great rig and this is why you can still pick one up brand new 16 years after it was introduced on the market. Estimating the value of a rig can be challenging. We collect prices paid by real hams over the years to help you estimate the current value of the ICOM IC-718. Just bought or sold this model? Let us know what you traded it for and help other ham operators!